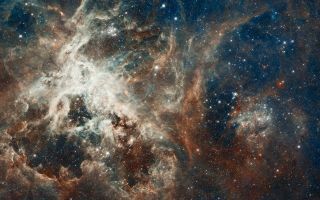 This amazing space wallpaper reveals 30 Doradus, which is the brightest star-forming region in our galactic neighborhood and home to the most massive stars ever seen. This amazing space wallpaper reveals 30 Doradus, which is the brightest star-forming region in our galactic neighborhood and home to the most massive stars ever seen. The nebula resides 170,000 light-years away in the Large Magellanic Cloud, a small, satellite galaxy of our Milky Way. No known star-forming region in our galaxy is as large or as prolific as 30 Doradus. This image was released April 17, 2012.